It is expected that residential property owners will adorn and furnish their homes with interior styles that are personally appealing to them, and others. One part of the home that is a prime example of this is the bathroom, in fact, it is given importance over other areas of the home in regards to designs that are easy to clean, yet aesthetically appealing. That is why tiles are used frequently, however, any new bathroom design should take into consideration the one thing about tiles that usually needs cleaning the most, grout. While a bathroom renovation contractor may suggest utilising tiles in your bathroom, limiting the amount of grout lines is advised because as time passes maintaining these, keeping them clean of mildew, can be laborious. One clever way to limit grout in the bathroom is by using large tiles, rather than smaller ones such as 4”x 4” tiles. Literally, interior home styles and styles are unlimited, making any new bathroom design idea possible, however, bathroom designs using tiles, marble or stone are threatened by grout accumulation of dirt, mildew and mold. Thankfully, there are effective ways to clean grout in the bathroom, and to limit the number of grout lines. Not surprising, it is in the shower where most grout develops grime because there is constant water use. 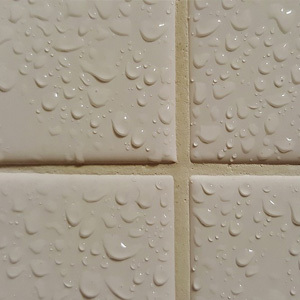 Water that is left to air dry on grout’s surface creates an environment that promotes the development of grime and mold. Instead, using larger tiles, tight fit marble, stone and even glass in the shower can eliminate ever worrying about dirty grout in the bathroom. You can also add either a shower curtain or a frame-less glass barrier to divide your toilet and shower, to prevent water from splashing onto tile flooring. Another alternative would be to consider a one piece Caesarstone counter top, instead of installing tiles. Although, these are helpful suggestions in how to use tiles in designing a new bathroom, that will make it easier to clean as the years pass, tile flooring and the use of tile in the shower are proven aesthetic additions to any home design. These are some helpful tips when selecting materials, designing and furnishing bathrooms. However, if you want to maximize the overall design and cleanliness of your bathroom, but you don’t have much knowledge about interior designing, not to worry. You can always contact an experienced bathroom renovation contractor here at Concept Bathrooms and Construction.